How to play the resurrected Murloc Shaman in Rise of Shadows. 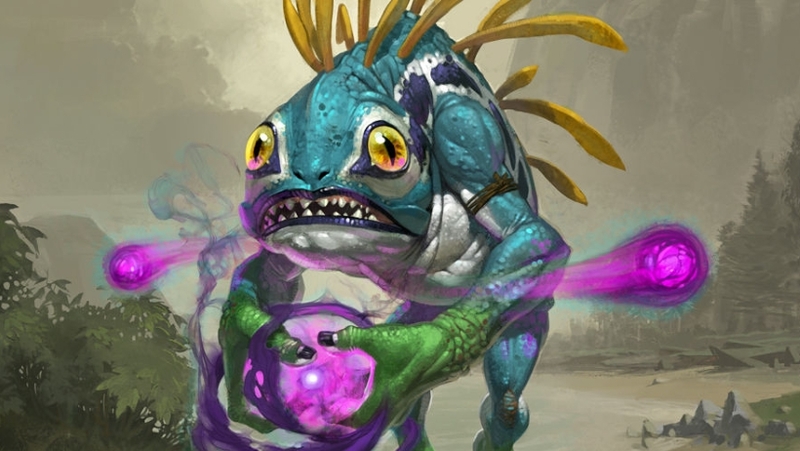 Our Murloc Shaman deck list guide features the best Rise of Shadows deck list for Season 61 of Hearthstone (April 2019). Our Murloc Shaman guide also contains Mulligan advice, card combos and strategy tips. Murloc Shaman is a Hearthstone deck that has been in and out of favour for some time in the card battler – in spite of Blizzard’s continual attempts to make it work. That said, it did see some play thanks to the Unite the Murlocs Quest card from the Journey to Un'Goro expansion. Sadly, that card is now moving out of the Standard format with the new set rotation, but a number of new Murloc-related cards have been printed that could bring the army of mrglling monstrosities back for Rise of Shadows. In the latest version of our guide to playing Murloc Shaman, we’ve gathered together the best deck list that’s seeing play right now in Hearthstone. Further down, you’ll also find some general tips and tricks on how to play the deck, as well as a breakdown on all the important card combos you can find in Murloc Shaman. This article contains additional reporting by James Pickard. Here's an improved version of Murloc Shaman that's starting to see success on the ladder. We'll keep refining our recommendation over time, and will fully convert our guide to the archetype once things have settled down. Murloc Shaman is all about overwhelming your opponent with a wide board of the fishy monsters by using their ability to buff each other to great effect. As many Murloc minions are also very cheap, you can play multiple cards on the same turn to stack their buff effects. Understandably, this pushes the deck towards more of an aggro approach and you’ll want to defeat opponents quickly before they can halt your aggression. Nevertheless, this version of the deck does come with a few control options that can help extend your lead in the early game, as well as a few options to help claw back your advantage if you happen to fall behind against Control decks. Ultimately, though, you’ll want to play fast and go for damage as much as possible to wipe out your opponent quickly! Send wave after wave of Murloc creatures at your opponent. The majority of your one or two mana Murlocs are excellent to play at this stage of the game just to get on the board early. The cards that will follow very soon - such as Coldlight Seer and Murloc Warleader - will start buffing those cheaper Murlocs into more significant threats that your foes will have to remove, or they will start losing Health rather quickly! You’ll want to push even harder for damage now and attempt to close out the game as quickly as possible. As the mana curve increases, so does the opportunity for your opponent to have a massive board clear, which risks taking you out of the game completely. Be sure to give yourself some insurance against a full clear by casting Soul of the Murloc. If you’ve established a rather handsome board and it remains uncontested though, a Bloodlust is usually enough to find the last bit of burst damage needed to finish off your opponent. You can always save Toxfin as a way to get through any bigger Taunt creatures your opponent tries to put in the way. Here’s where Murloc Shaman really struggles as more Control-oriented decks can start to get a foothold and starve you of resources while they run away with the game. You can desperately try to draw a few more creatures to play using Murloc Tastyfin, or wait for a huge tempo play using Scargil to plop many Murloc creatures onto the board for a low cost. Whatever the case, it’s the big risk plays that can only get you out of this spot. 1. You may both end up racing to kill one another, but don’t be afraid to take worthwhile trades when you see them in order to gain a lead. 2. Once your Murlocs have been buffed, trades become a more worthwhile pursuit against aggro as you can trade up into stronger minions with your increased Health. 3. If you hit turn five and have a wide board already established it may be worth burning the Bloodlust to deal some huge burst damage. Even if it doesn’t outright kill your opponent they might be in such a weak state they’ll be unable to recover. 4. If you get lucky with the random Lackeys you generate you can find more ways to remove their minions or trade up into them – or simply push for extra damage! 1. Speed is the key here: play as much as you can as fast as you can and go for face damage wherever possible. You’ll want to burn them down before they can stabilise. 2. Give yourself some security against board clears by playing Soul of the Murloc before their big removal turn. They may still use it to wipe out your board but the initiative will remain yours thanks to the additional Murlocs that spell summons. 3. Try to save your Bloodlust for the finishing move. If you spend it early to deal some hefty damage you may just give your opponent time to recover it back with Armor and heals. Instead, use it for a surprise finish while they still think they’re out of reach of death. 4. Make full use of the card generation and draw effects from Underbelly Angler and Murloc Tastyfin in order to keep your hand full of resources. A continuous barrage of new creatures can overwhelm many Control decks. 5. Toxfin is a good card to save if you want to take out one of your opponent’s largest threats using the Poisonous keyword. Use it to remove that big Taunt and go straight for their life total. 1. Murloc Tidecaller: Is buffed by one Attack by any future Murlocs you play so the earlier it’s on the board, the better! 2. Underbelly Angler: As you’re playing a lot of cheap minions quickly this ensure you can keep up the pressure with more Murlocs right from the start. 3. Murloc Tidehunter: A decent value two-drop that pushes you wider on the board early. 4. Sludge Slurper: Strong one-drop with the added bonus of granting you a Lackey to play the very next turn to keep up the pressure. 5. Murloc Raider: A bog-standard one-drop that gets better when buffed. A lot of cards synergise well together in Murloc Shaman so here’s a closer look at some of the more important ones in the deck. Remember these and you’ll be piloting the deck masterfully in no time! - Each time you play a Murloc class of minion, your active Murloc Tidecaller will gain an extra point of attack. - Murloc Warleader gives all other Murlocs an extra two points of attack, but remember that this effect disappears if the Warleader is destroyed by the opponent. It's not a permanent buff. - Other ways to buff your Murloc’s stats include Grimscale Oracle and Coldlight Seer. Use these two minions to ensure your others can deal significantly more damage or survive longer. - With the many cheap Murloc minions you’ll be dropping onto the board, the card gain potential with Underbelly Angler is massive. Time it wisely to refill your hand when you need to trade away minions or find those final few points of damage. - You can orchestrate a huge tempo play using Scargil. If you wait until a later turn you can combine it with a few other Murloc minions to create a wide and powerful board out of nowhere! - Bloodlust is one of your core finishing moves, and massively empowers every friendly minion on the board for a single turn. Use this card when you've built up a wide board and always check how much lethal damage you've access to. Grimscale Oracle: Gives all of your Murlocs a useful one Attack buff. Not very exciting on it’s own but when it hits a wide board it represents a big bump in damage. Murloc Tidecaller: Can get out of control very fast if your opponent doesn’t have a way to remove it thanks to all the other Murlocs in the deck. Soul of the Murloc: Gives you some protection from board clears if you have a lot of minions down. Even if your opponent removes them, more Murlocs will be ready to replace them! Underbelly Angler: This minion offers a lot of power to refill your hand, even giving you a chance to acquire more copies of the powerful buff Murlocs this deck already runs. Coldlight Seer: One of the most substantial buffs available to your Murlocs in this deck. That extra Health can ensure they survive longer in trades or escape from some board clears. Murloc Warleader: Perhaps the most impactful buff for your Murlocs in the deck if you’re looking for more damage. A minion with decent stats too! Nightmare Amalgam: Not a Murloc in the traditional sense but as it takes the form of all minion types it becomes a nice inclusion, especially for the cost in terms of stats. You can run Primalfin Lookout or Rockpool Hunter if you need a replacement. Murloc Tastyfin: The second of the deck’s card draw tools. This is especially good as it’ll fill you hand back up with more Murlocs that standard card draw. Scargil: Enables you to make a big tempo play by throwing a lot of Murlocs onto the board for not a lot of mana. Bloodlust: The perfect finishing move for when you have a wide board full of Murlocs.